As you get older some things change. We try to eat healthier, exercise, and go to the doctor regularly to head off any health issues. Looking after your health should include a hearing evaluation from Roseville Diagnostic Hearing Center, because hearing is an important part of your physical and mental wellbeing. As we age, mental and physical changes taking place. That just means we need to adapt – and keep moving forward. Signs of aging include eyesight and hearing changes, decrease in strength and stamina, memory loss and chronic illnesses. Most of these changes are natural, so recognizing them and dealing with them is very helpful. The good news is that you don’t have to live with them, and even though the aging process is dictated a lot by genetics, but there are many things you can still control, and you can stay as healthy as you want as you get old. As you get older, you need to make sure you are getting adequate rest. Your body needs more time to relax and your mind also needs some extra time to re-boot. If this means you need to take a nap in the afternoon because your sleep patterns have changed as you get older, then by all means nap. But make sure you aren’t sleeping so long as to disrupt your sleep at night. Make it a short, refreshing nap. Get your vision checked regularly. As we age, our eyes and vision deteriorate. Getting glasses, contacts or making sure you are taking care of cataracts is important. You need excellent vision for safety reasons and to continue with hobbies and projects to stimulation your mental well-being. If you’re exposed to a lot of noise, be proactive and make use of ear plugs or noise cancelling headphones. Lawnmowers, chainsaws, construction noise, concerts and anything that makes you shout to be heard is too loud. Roseville Diagnostic Hearing Center can help you out with custom ear molds and ear plugs and there are even special ear plugs for musicians. Turn the volume down. Ear buds and headphones are great for listening to your music, but don’t take them as an invitation to turn the volume up and keep it up. Give your ears time to recover. If you’ve been exposed to excessive or loud noise for a prolonged period, step outside if you’re at a concert or music club. A five-minute break will do you a world of good. The next day give yourself some quiet time, since researchers say you may need up to 16 hours to recover from one evening of loud exposure. 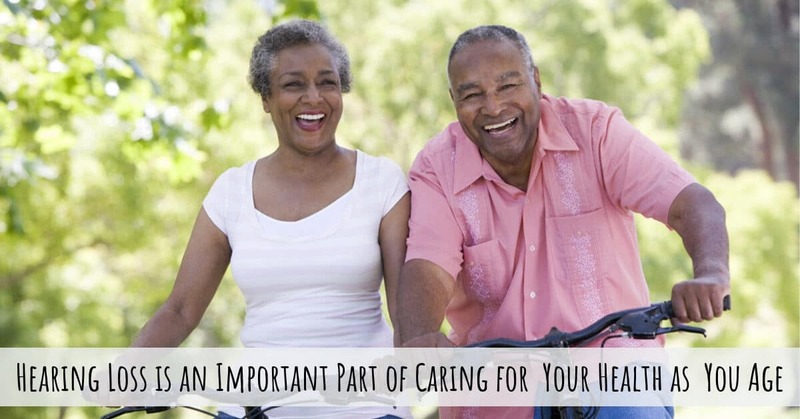 You visit the doctor regularly to monitor your overall health, get cancer screenings, and test your vision. You need to do the same for your hearing health. Untreated hearing loss has been found to lead to sleep apnea, cardiovascular problems, hypertension, depression and early on-set dementia. Sadly, many Americans shy away from getting hearing aids, and the average American adult diagnosed with hearing loss will wait up to seven years to get hearing aids. Why would you think getting glasses doesn’t make you look old, but hearing aids do? Don’t let the stigma of hearing aids deter you from exploring your options when it comes to optimal hearing. There are dozens and dozens of models of hearing aids to suit every lifestyle and hearing need. There are devices that fit in the ear, over the ear, or even in the ear canal, so rest assured that there’s a hearing aid that will work for you. At Roseville Diagnostic Hearing Center we’ll help you find hearing devices that are adaptable to your lifestyle and your budget. You can even test drive them to make sure you are getting the perfect match. An annual evaluation will make sure you keep on top of your hearing health, and notice any changes to your hearing health as soon as possible. If you think you may have hearing loss, whether due to aging, exposure to loud noise, or any other factor, give us a call at Roseville Diagnostic Hearing Center and see what we can do for you.